This post started as an OER Glue test (a promising new tool to "Gather content, stitch it together, and engage learners w/o reinventing the wheel."). But I figured I'd add some educational content as well. So (if you have Etoys installed) you should see an Etoy open up inside the page below. If you don't see it, get it, its free, its cool and its one of the best things I have found for creating educational content, letting kids learn, explore and express ideas. So in working on my Algebra course I needed to come up with a way to have the kids learn about the Order of Operations. So my first attempt is to create some "playthinks" that kids can use to not only learn about, but also to communicate their understanding. I created the playthinks in Etoys, as it allows the kids to manipulate and use the playthinks in a presentation to demonstrate their understanding (well that's the plan anyway ;) Above is an image from my first effort. Kids can create their own number pictures and use them as well. Any item dropped into a "variable box" will automatically resize to fit. You can even drop other operations into the "variable boxes". Please let me know what you think and any ideas for improvements. Pi: The Archimedes way: Can 6th graders figure it out themselves? Why I think this is possible: I created a project in Etoys (Circle Explorer) which allows kids to inscribe and circumscribe a circle with a regular polygon of N sides. When I have shown this to kids (as young as 8) they comment (in a number of cases without prompting) "hey its filling up the circle". 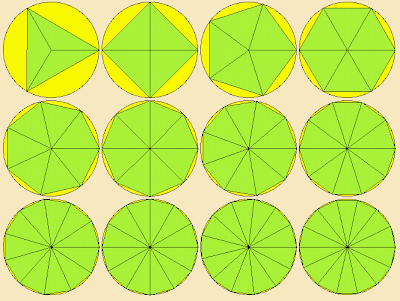 The regular polygon is made up of triangles. I have seen kids can figure out how to determine the area of triangle using GeoBoards (Here is a sample GeoBoard project in Etoys that uses squares, you can add a triangle by opening the object catalog, click on find and type triangle, then move around the vertices to create different triangles.). First ask the question: How can we figure out the area of a Circle? 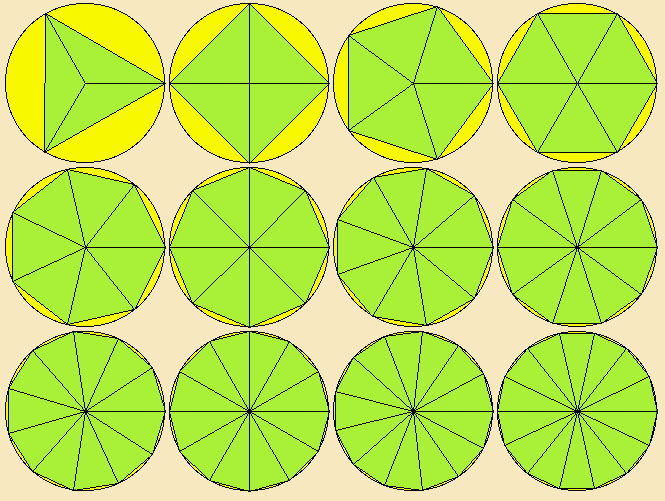 Have them record in a table the "# of sides" and "area of the Polygon" This can be done with both inscribed and circumscribed polygons (the diameter of the circle can be set by them or they can inspect it by looking in the viewer for the circle object. Have them plot their results on graph. The other possibility is to have them determine the circumference of the circle and then the ratio of that to the Diameter of the circle. They could figure out the Circumference using the Ruler Object within Etoys. Provide other activities within Etoys (or other similar tools) and hands on activities that can help facilitate understanding. Provide sample lessons and/or a set of lesson plans for these concepts. Point me to already created lessons (that I can use as is or use to derive lessons that can be freely distributed under a Creative Commons or similar license). Etoys is a free educational software tool for teaching children powerful ideas in compelling ways. It works on almost all personal computers and OLPC laptops. Projects created within Etoys can be easily modified by people around the world (for translation into local languages and cultural symbols). Any kid can create their own work. It allows kids (young and old) to make their own models, stories and games. Geogebra may be another good tool, but I need to figure out how the kids can inscribe/circumscribe a circle with Geogebra. Coke v Sprite - have the kids build a model of the problem. So I decided to try and figure a way to let kids model this problem in Etoys. My first attempt used kedama to show the "soda molecules" moving around and let the kids move the soda into the eye dropper and then into the coke glass and back. I then decided on using a simpler approach using a set of 10 Sprite boxes in a container and 10 Coke boxes in a container. And asked the kids to move the 2 Sprite boxes into the Coke container, then shuffle the Coke container and take the top four boxes and move them back to the Sprite container. And have them do this a few times and think about how this relates to the Coke v Sprite problem. The completed project is here, but I think it might be better to walk the kids through building a model themselves. Finally the simplest approach at a table with a deck of cards using 10 red cards and 10 black cards. When I did this with my son, who had also seen the other two methods, he just kept shaking his head and muttering things like "that's crazy, it doesn't make sense". He believed what he saw but it so went against the model he had in his head there was major cognitive dissonance. I told him this was great, when you find something that seems really couter-intuitive, but the evidence proves its true you are really onto something and learning. I liked this approach best (sometimes its best to "step away from the computer ;). What to you think? How can we use this problem to help kids learn? While I agree with Papert "it doesn't much matter what mathematics we teach them as long as they are learning to reason like a mathematician." That said if your are going to reason you need to reason about something, so I picked Algebra. Description: This course will help students not only be proficient in basic Algebra and Geometry manipulations (which are needed for Standardized tests) but also provide concrete experiences to help children develop a deeper understanding of mathematical concepts. Course material will be based upon a variety of material including some Open Source, Algebra Textbooks, Geogebra, Scratch, Etoys and other materials. Students will have homework assignments, quizzes and tests during the semester. Teacher: Steve Thomas - studied for his Masters in Mathematics Education at Rutgers with Robert B. Davis. He has also developed mathematics course material as a member of the education committee for Etoys which is part of One Laptop Per Child. Clean Water or Education? Why not both! I am working on some education projects to provide education and clean water for Haiti (and others) through OLPC and Waveplace. The goal is to teach kids about clean water and have them build their own solar stills. Working on developing engineering challenges for the kids and providing them materials to design and build their own solar stills.